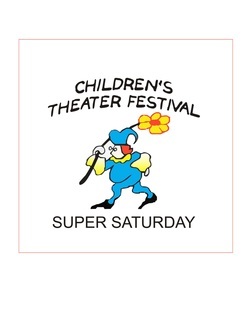 Here is a preview of our fabulous theater lineup for Super Saturday 2015! He's a musician! He’s an inventor! He's a nut! He’s been called the Thomas Edison of entertainers, a wizard of one-liners and a lightning bolt of lunacy. Bumbling pirate professor Billy Bones, played by David Engel, teaches youngsters how to be good pirates with zany lessons on how to stand, talk, sing and laugh like jaunty Buccaneers. A Fettucini Brothers show is the perfect mix of clean, original comedy, blended with just the right amount of juggling and variety and then served up with some intelligent interactive fun. Porkchop Productions "Little Red Riding Hood"
This fractured version of the fairy tale brings all your favorite characters (plus some new ones) to life in one action-packed adventure! Farmer Jason's lively folk and bluegrass style educates and entertains children with songs about farm animals and farm life. Crabgrass Puppets "African Adventure Tales"
Two funny folktales from Africa come to life with stunning puppetry, spectacular scenery, and infectious music. Ballet Spartanburg "Peter and the ﻿Wolf"
The ballet version of Prokofiev's classic musical tale of a brave boy who catches a wolf, with some help from his friends! This high-energy, Australia-themed show combines music, culture, science, puppetry, and comedy, along with didgeridoos, Aboriginal clap sticks and bull roarers, African djembes and Caribbean shakers!